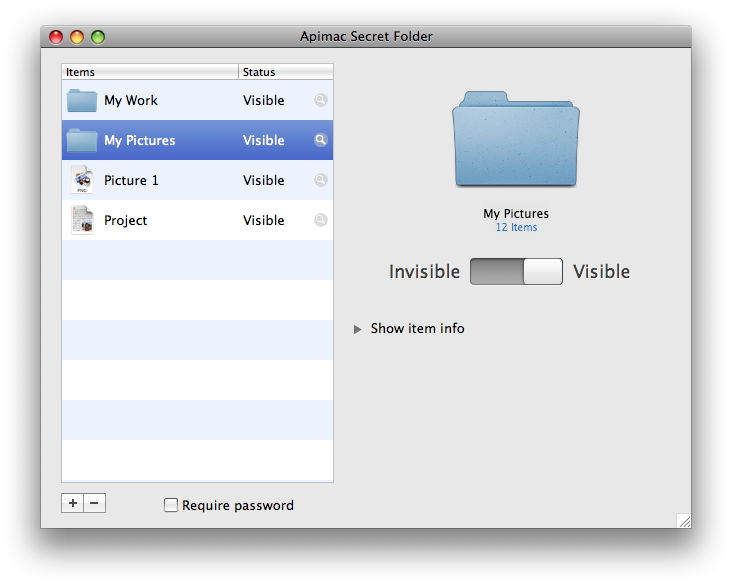 How to make invisible folders and files on a Mac? Apimac Secret Folder is an app for Mac that provides an easy and fast way to protect personal documents and avoid them being seen, modified, or erased by other users. It allows users to hide folders and their contents. Files and folders can be added by means of a single click on a choose dialog box or via drag and drop. The app is really simple to use and can be protected with a password for extra security. Secret Folders is very useful to keep your information away from prying eyes or kids who may accidentally modify or delete your files. Encrypting files and folders has never been easier. Protect Files makes it easy to protect your files, folders and documents with secure encryption and password technology. The ‘Require Password’ check button lets you protect the app with a password. If this option is selected, at the opening of Apimac Secret Folder a password dialog box will be displayed. To gain access to the application it will be necessary to enter the correct password. This application uses the standard functionality of the operating system to make folders and files invisible. Programmers and experienced users could gain access to a folder made invisible and there are some applications that let you open invisible files or files contained in a folder made invisible. Whether you need advanced levels for protecting your data, there are other ways as protecting information on removable media (as creating encrypted disk images using Protect Files) or using Mac OS X FileVault. 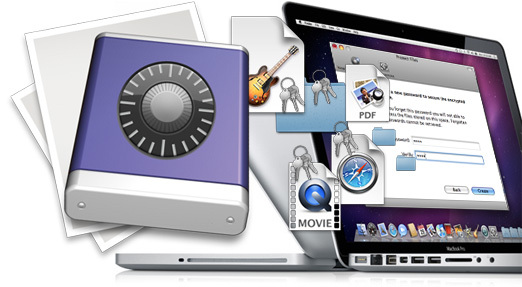 To learn more about Protecting information on removable media and on Mac OS X FileVault, open Mac OS X Finder’s Help. You can learn more about our Mac Security tools by visiting Mac Data Protection page. For any product information, please contact our support, we are happy to provide information about our software and technical assistance. While expert users might prefer to use Mac OS X Disk Utility to create their own disk image files, this tool is aimed to users preferring a dedicated solution to guide them step by step in creation and use of the encrypted space. The maximum size of a space created is 99 GB. This limit is used to prevent too long opening and closing of the spaces. Mac OS X 10.6 or later (Snow Leopard, Lion and Mountain Lion). Approximately 28MB of available disk space.